These high-polished men's wedding bands carry an air of sophistication with enough character to remind him of your special day. Sleek, polished perfection resonates off the surface of a glimmering high polished wedding band finished to flawlessness. Men’s polished wedding bands follow a simple, traditional design built specifically for a sophisticated and purely classy man. With a wedding band as smooth and lustrous as a men’s polished band, the possibilities are endless and the everlasting sheen is luminous with no means to an end. When chiseled appropriately, the polished finish on these classic men’s wedding bands should be reflective to the extent of having the capability of seeing your own reflection glimmering off the surface. An immensely glossy surface attracts attention with a mirror, polished metal appearance. Incorporating your wedding band and your partner's wedding band for a pair set is also an option we entertain at Icing On The Ring. Although it is not customary to have matching wedding bands, tying the two his and hers wedding bands together creates a unified unit. The two rings may have similar traits such as a similar metal, identical shape, or matching vibrant details. However, each wedding band may also be vehemently different to keep on trend with today’s fashion-forward market. Showcase each partner's individualistic style and distinct bravura to complement the personality. 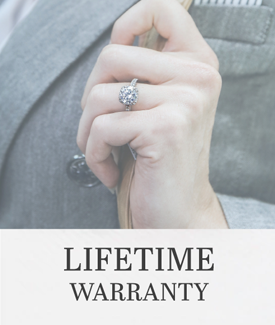 Each of these options should be contemplated when deciding on a simple wedding band at Icing On The Ring. Let our skilled and expert jewelry artisans assist and guide you on the special path to beloved matrimony. Each couple is encouraged for bringing in designs to suit a wedding band style seamlessly. Our on-site consultations will help open you up to the many options readily available for our future married couples setting on their own endeavors and eternal enterprises. The perfect choice for the man who maintains a simple style, this 14k yellow gold men's wedding band will pair wonderfully with hers. This 14k white gold polished men's band features milgrain accents towards the edges for a refined look. Here is a simple, yet stylish men's wedding band. The two grooves of milgrain set within the 14k white gold high polished metal boasts a classic, straightforward look.